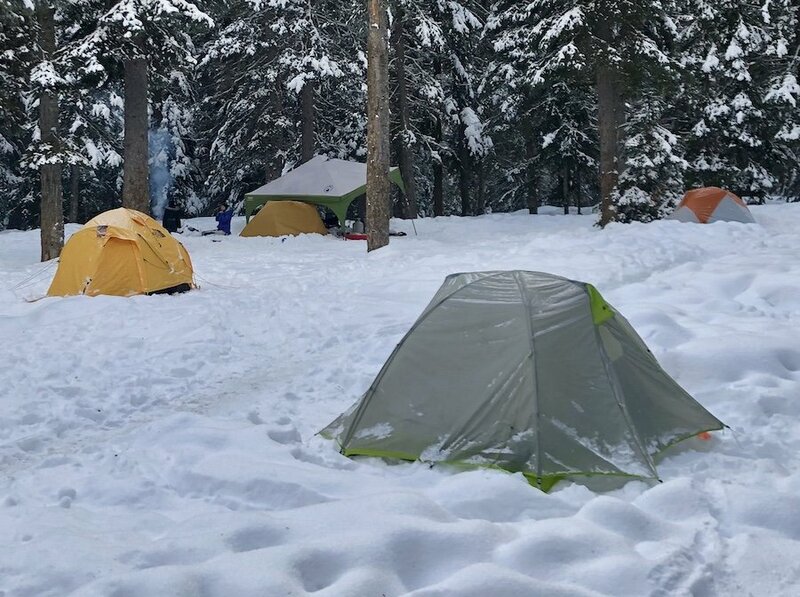 If you’ve never tried winter camping, you’re missing out on a side of nature that is pristine, beautiful, and most importantly, quiet. 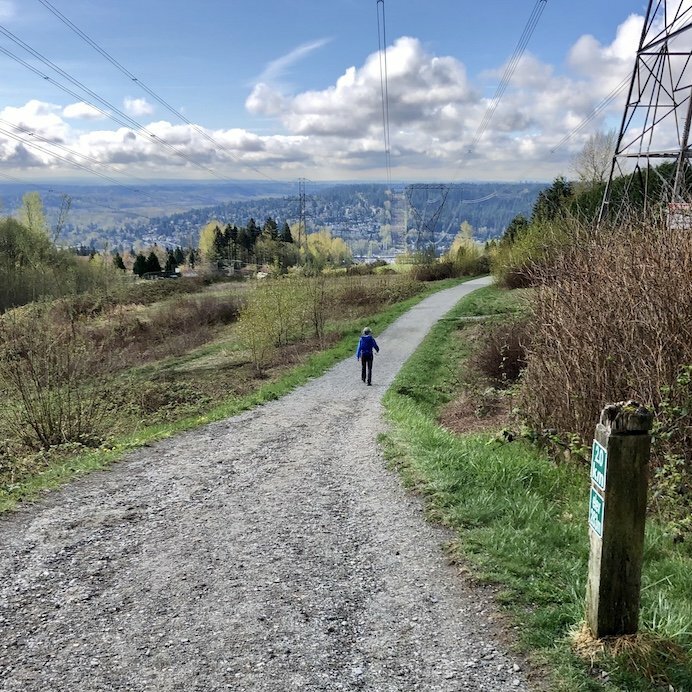 Gone are the hoards of people drawn outdoors by the summer’s warm weather in the comfort of their car camping set-ups, leaving only the hardiest of nature-lovers to enjoy the solitude of the campgrounds. 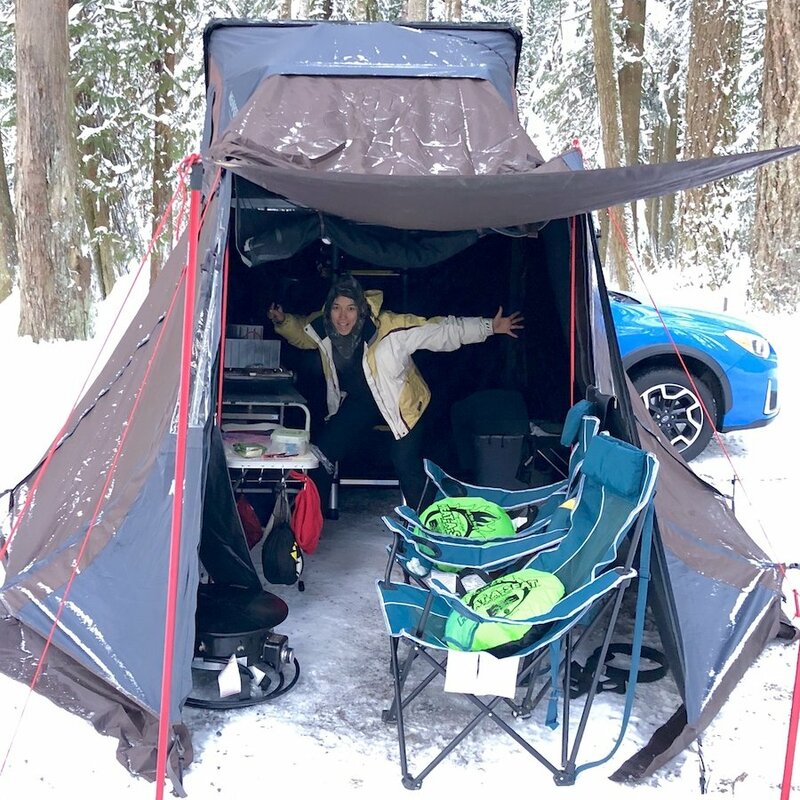 While there are more challenges involved in doing winter car camping, it doesn’t take too much more gear and planning to keep yourself warm and comfortable so you can enjoy the experience. If you’re curious and want to give it a try, below are my main tips to help you get started. 1. Choose an Appropriate Location. Mount Seymour's group campsite and Lone Duck 1 campground at Manning Provincial Park both have shelters for winter campers. Mount Seymour's group campsite is open for winter camping use (free of charge) and is equipped with a group shelter, wood stove, picnic tables and a fire pit. The group camp is only 50m from the parking lot, where there is also a heated lodge. The Lone Duck campground at Manning Provincial Park ($13/night) also has a shelter with picnic tables, counter top, wood stove and a fire pit. 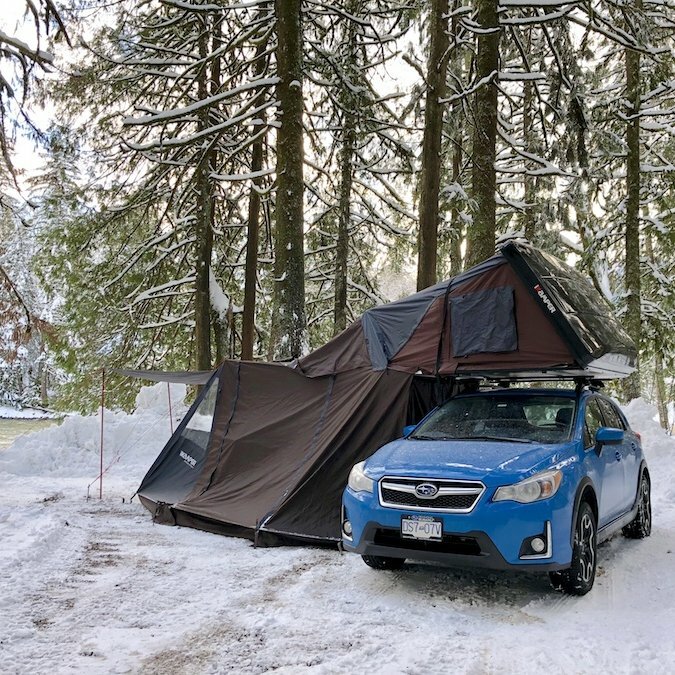 If you have a bit more gear, experience, and have your winter car camping set-up dialled in, there are a couple of other winter car camping locations close to Vancouver, including Deer Lake campground at Sasquatch Provincial Park or Gold Creek campground at Golden Ears Provincial Park. These locations don't have shelters, so it's up to you to make sure you have everything you need for your comfort and safety. 2. Invest in Clothes and Gear to Keep You Warm. You'll want to have different kinds of warm clothes for different purposes while your winter camping. 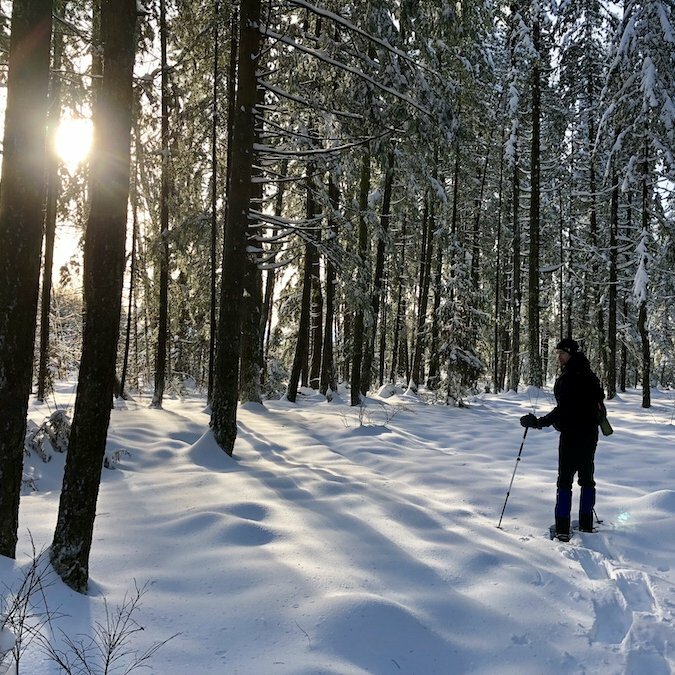 If you're going out snowshoeing or cross-country skiing, you'll probably be fine with lighter layer winter clothes, like insulated base layers, non-insulated boots, thin gloves, and a shell garments, as the physical activity will keep you warm. But once you're settling in and relaxing, you'll want your warmest gear on hand. 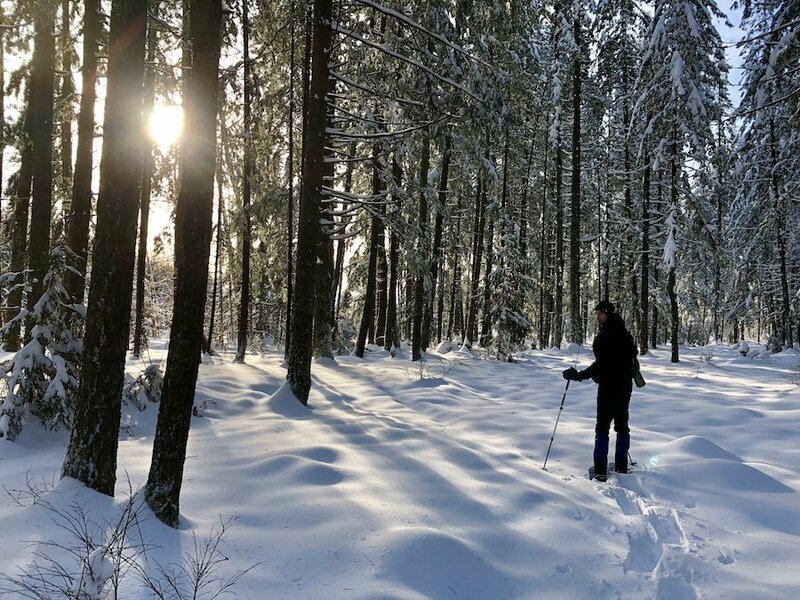 I use a full-insulation winter ski parka and ski pants along with my merino wool base layers, fleece pants, fleece mid-layer, ski socks with merino liners, ski gloves, insulated boots, neck gaiter and hat. Your sleep system is just as important, especially if you're sleeping in a tent. 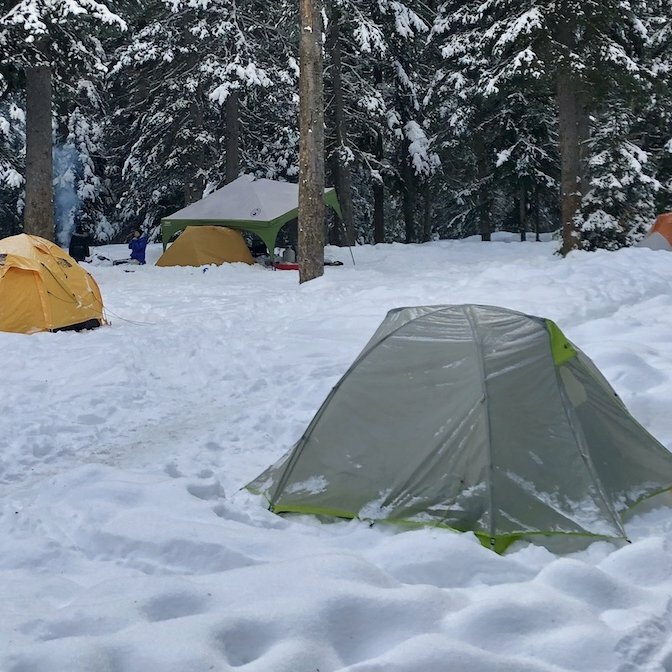 Whatever tent you're using, make sure the top of it is sloped so that snow will slide off if you do get precipitation. You should have a sleeping mat with a high R-value, 4 or higher, a sleeping bag that is rated for the nighttime temperatures for that area, or if you don't have that, liner bags/over-bags to increase the insulation of your sleep system, or extra warm clothes that you can sleep in comfortably. You can also get a tent heater like the Mr. Heater Buddy Heater to warm your tent up when you're turning in for the night, then warm it up in the morning when you wake up. (*Note: It's not safe to leave them running while you're asleep.) Alternatively, you can pick up a couple of hot water bottles, fill them up with boiling hot water, then throw them into your sleeping bags to warm them up. Nalgene bottles can also work for doing this. If you you’re not staying at a campground that has a shelter, you’ll want some sort of shelter system to protect you from wind and help contain heat from a fire. Tarps are the cheapest, most versatile option, though they can also run more expensive if you invest in ones with more compact, lighter materials. 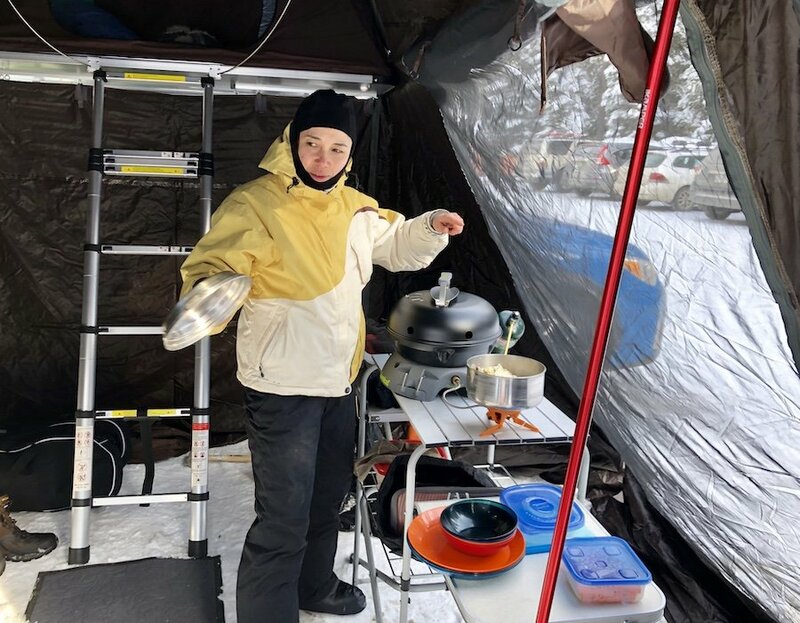 They can be set up in a lean-to fashion to help contain heat from a fire, or as an A-frame over a snow dug table/seating area to protect against wind while you cook/eat. 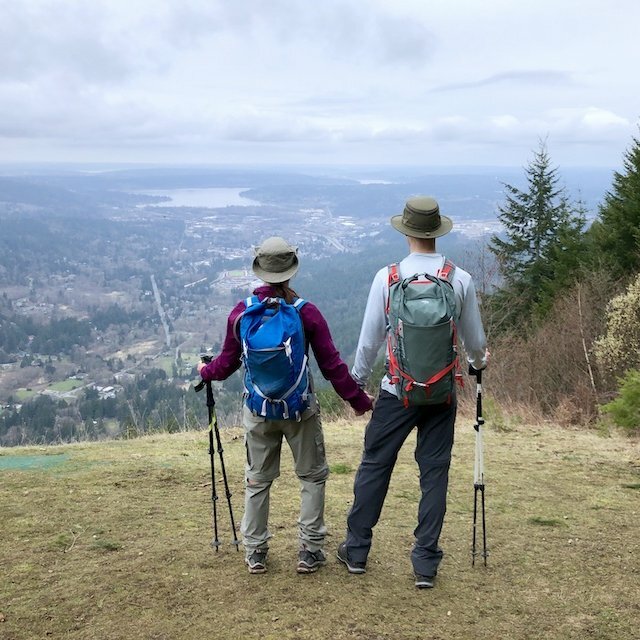 If you’re going to go this route, you should familiarize yourself with how they work and practice setting them up ahead of time, so you’re camping experience is less stressful. If you already have a camping shelter, you can also do some hacking to turn it into a lean to of sorts, as you can see in the back of the photo below. There are lots of ways to go about things if you're creative. 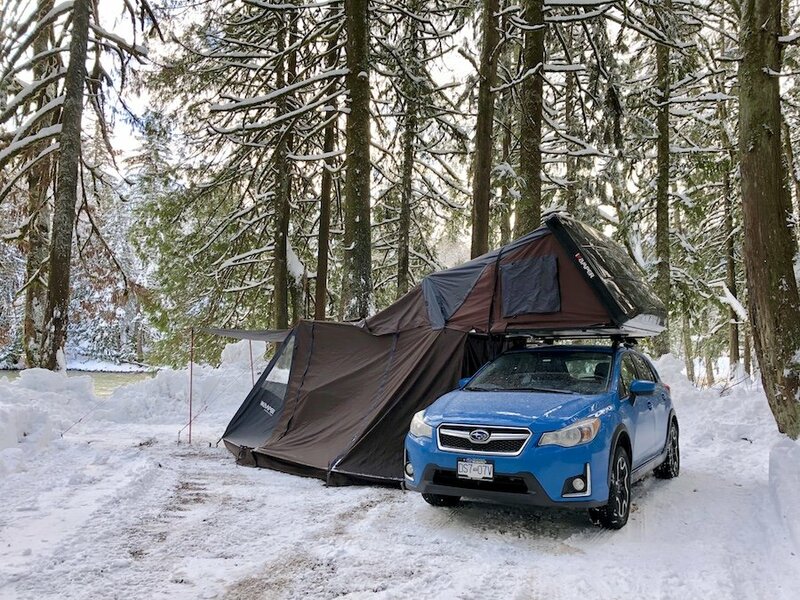 Chris and I invested in iKamper’s Skycamp rooftop tent, which we use for our winter car camping, along with the attachable annex room and additional insulation layer. It gets us off the ground, making us warmer when we turn in for the night, and the annex room provides shelter for cooking and helps contain heat from our propane fire pit. It’s no heated trailer or RV, but we like it. :) In the photo of me above, you can see our Heat-a-seats on our camp chairs, which without any power, reflect our body heat back into you keeping you warmer. Adding fleece blankets also helps close drafts on the back of your chair and keep legs warm in the front. 3. Plan and Prepare Your Food Ahead of Time. The nice thing about winter camping in cold temperatures is that it’s hard to overeat. Your body needs more calories to stay warm. You can enjoy more of your favourite calorie-dense comfort foods. Having plenty of hot drinks, coffee, tea, hot chocolate, apple cider, etc, will help your core temperature stay up. When you first arrive, you’ll probably have a good amount of water to use initially. Adding some salt to it will help slow it’s freezing time, but depending on how cold it is, it’ll probably still freeze overnight. 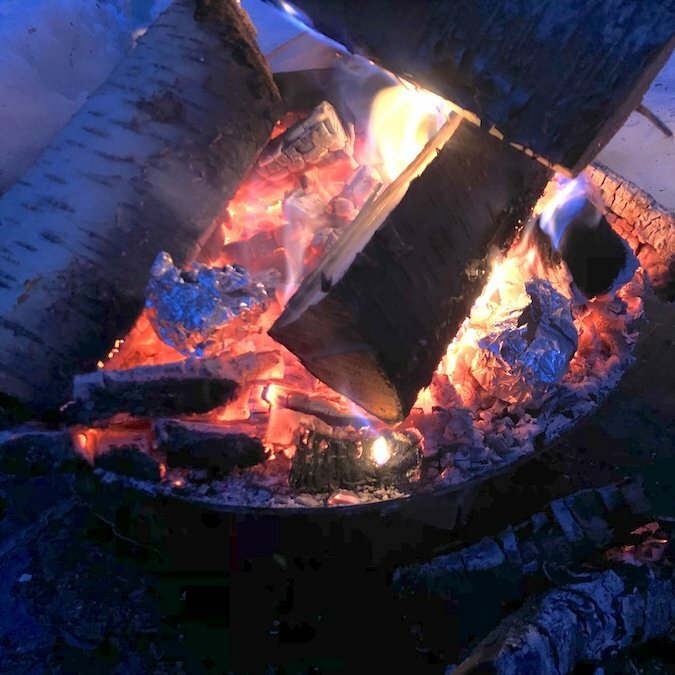 If the lake is frozen over, you’ll probably have to melt snow for your water, so make sure you have enough fuel for your stove and/or wood for your fire for this purpose. Food prep, cooking and cleaning is a more cumbersome process if you’re doing it outdoors without a heated shelter. If doing so, your best bet is to have all your food pre-prepared and packaged to minimize food prep, cooking time and cleaning. 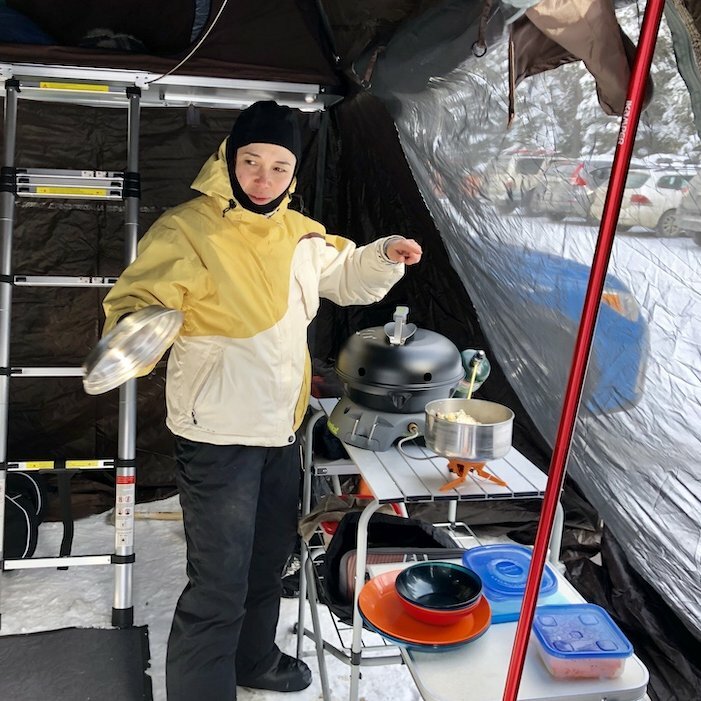 Check out my blog post on the best food choices for winter camping for more details. 4. Have a Variety of Physical Activities Planned. Staying still means you need more ways of staying warm. But you probably aren’t interesting in winter camping because you want to hole up all day just to stay warm. 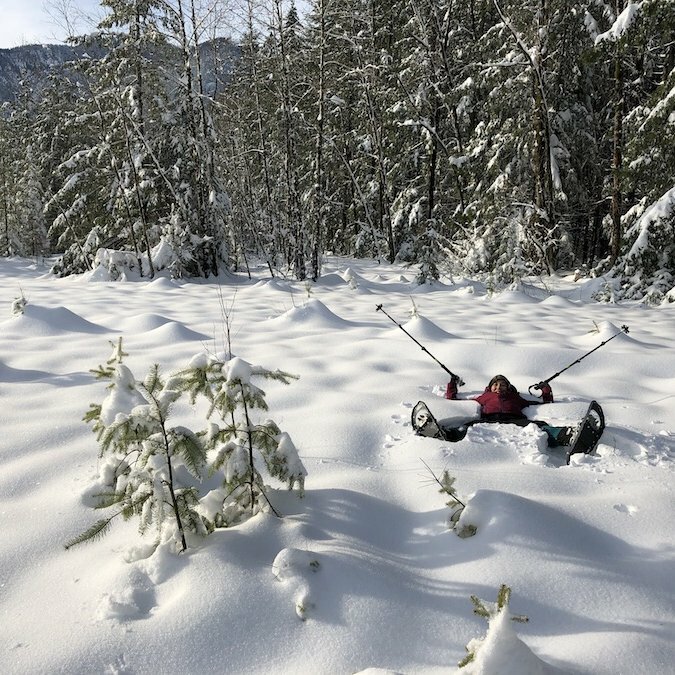 Plan to spend more of your waking hours exploring nature by doing physical activities like snowshoeing, cross-country skiing, ski touring, or even something as simple as sledding/tobogganing. 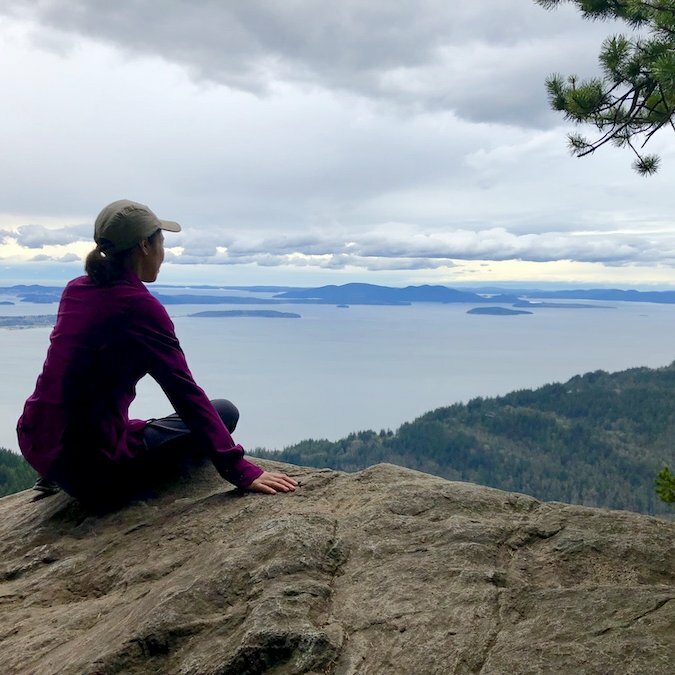 You’ll want to make sure you have lighter layer clothing specifically for those activities to minimize sweating, and when you’re finished, chance out of them and dry off before putting on your fresh warm layers. 5. Spend Time by the Fire. 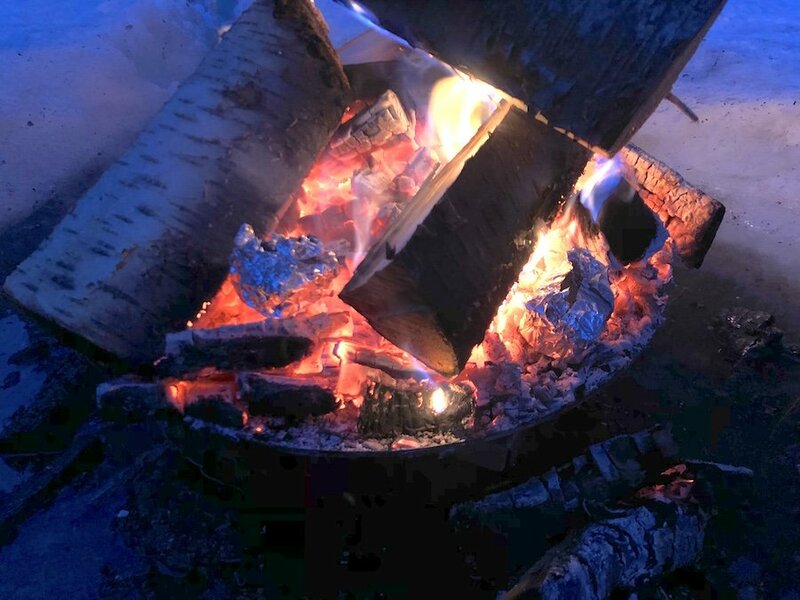 After the day’s activities are done, there’s nothing like bundling into some warm clothes, having a good meal, some hot drinks and bunkering down next to a fire. It’s also a great way to start the day before heading out to enjoy winter activities in the sun. Our preferred system is to use a propane fire pit so that we just bring one large tank for everything, cooking and fire, and portable heater. Wood fires are a nice luxury once in a while too as there are never any burn bans in the winter. They can be a bit more hassle as they can melt away snow and wood is heavier and more bulky to transport. But there’s something soothing about the random beauty that a wood fire provides. If you do go for a wood fire, take advantage of it. Grab some stick and cook sausages or marshmallows while staying warm. You can also cook a lot of different meals in or over a fire simply by wrapping them in foil. You can read more about this in my blog post about the best types of winter camping meals. 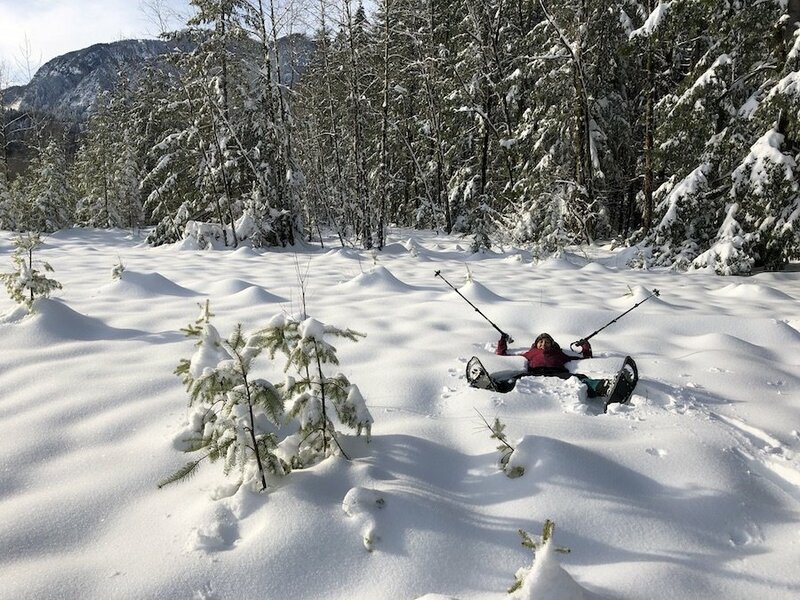 I admit that there are more challenges when it comes to winter camping versus any other season, but the rewards are awesome if you can get your winter camping set-up and planning process down. Winter has its own special beauty that combined with the solitude gives you a wonderful respite from the chaos of modern life.